Heroes Evolved : Pengwing Item Build Guide. Pengwing is the new hero in Heroes Evolved game. You do not be fooled by its cute appearance. Because he is a pretty dangerous carry. 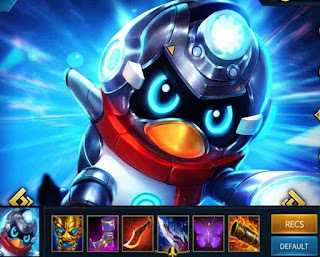 Now we will build the best gear for Pengwing. In order for you to win the game and get the MVP title. Laser Focus (Passive) : Pengwing charges his laser cannon every 5 seconds. Once Charged, next attack becomes AOE, launching laser beam that deals bonus physical to enemies and slow 30% movement speed for 3 seconds. [Bonus Damage : 60/90/120/150 | Cooldown : 5 seconds]. Focused Fire (Physical) : Fires 4 missiles at a target direction, dealing physical damage on 4 random targets within range. If the enemy units are less than 4 in the target area, enemies may be hit by missile again. Affected targets are slowed by 20% for 3 seconds, and targets taking consecutive damage only take 50% damage per subsequent hit. [Damage : 90/120/150/150 | Cooldown : 8 seconds| Cast Range : 1000 | Mana Cost : 80 ]. Belly Slide (Magic) : Slides at a target direction, planting 3 landmines that deal magical damage to nearby enemies. [Damage : 50/100/150/200| Mana Cost : 100| Cooldown : 8 seconds| Radius : 800]. Destruction (ULT) : Fires a partical cannon towards a target direction. When hitting the first enemy hero or traveling to the farthest point, the cannon explodes, dealing physical damage and causing knockback on units within range. [Damage : 350/475/550| Mana Cost : 150/175/200| Cooldown : 48 seconds| Cast Range : 900| Knockback Range : 600/700/800]. Pengwing Item Build – Deadly Attack. Reaper Mask : +45 Damage| +25 Attack Speed| +250 Health| +10 All Attributes. Unique Passive : +20% Physical Life Steal. Unique Passive – Savageri II : After attacks an enemy hero, increases 90 Movement Speed and reduces target’s 30% Movement Speed for 2 seconds for melee heroes, or increases 40 and reduces 12% for ranged heroes. Effect does not stack. Wizard Boots : +20 Spell Power| +80 Movement Speed. Unique Passive : Reduces abilities cooldown by 10% (Cooldown reduction cap is 40%). Executioner’s Cut : +60 Damage. Reduces abilities cooldown by 20%. Passive : +12% Physical Life Steal. Each enemy unit last hit grants 4 Damage and 0.5% Physical Life Steal. Max stack is 10. Effect disappears upon death. (Stacks with the souleater sword). Mana Slicer : +20 Agility| +36 Attack| +35 Attack Speed. Unique Passive : +10 Movement Speed. Each basic attack burns 60 mana on targets and deals magical damage. Active ability : Immediately deals 250 + Agility x2 magical damage to the target and slow 30% movement speed for 3 seconds. Cooldown : 30 seconds. Butterfly Wings : +30 Agility| +30 Damage| +40 Attack Speed. Unique Passive : +35% Dodge chance (dodge chance cap is 35%). +10% Movement Speed. Ragnorak Cannon : +100 Damage. Unique Passive : Grants each attack 20% chance to deal critical damage. Increases critical damage to 250%. Minor : Increases 200 initial coins. Major : +5 Coins per 5 seconds. Minor : Attacks deals 20% more damage on troops and jungle creatures. Major : Jungle creatures drop +10 coins. Minor : Reduces 1 seconds when teleporting. Major : Teleport can be targeted to an ally unit. Hopefully this post can help you in playing game HE. Good luck!